A magnetosphere is the sphere of influence of a planet’s magnetic field. 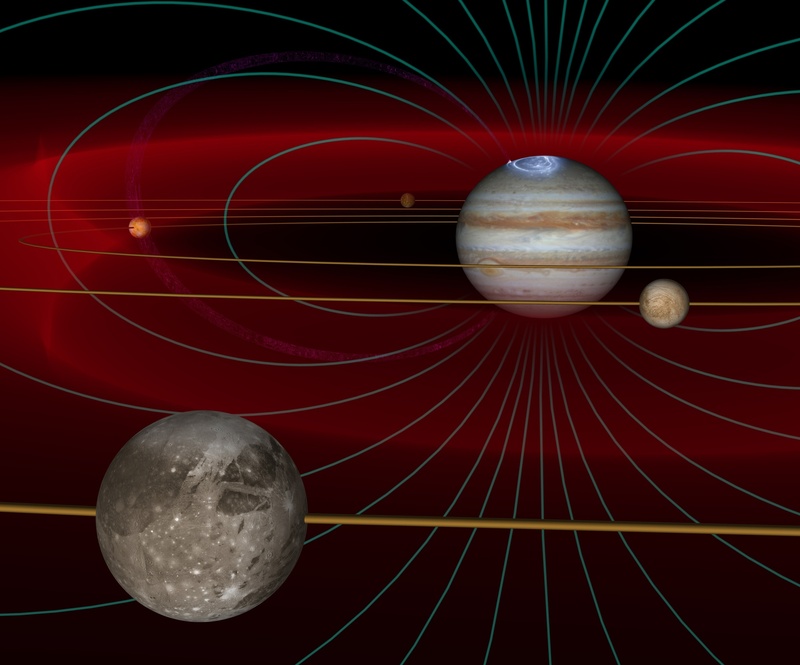 The giant planets of the outer solar system have strong magnetic fields whose influence extends far beyond their planets, encompassing many of their moons. The stronger the magnetic field, the larger the magnetosphere. The Earth’s magnetosphere is about ten times the size of the planet – but the whole of the terrestrial magnetosphere would fit inside the planet Jupiter. Over a thousand suns would fit inside the vast volume of Jupiter’s magnetosphere. The volcanic moons Io and Enceladus eject up to a ton of gases every second into the surrounding space. The interaction of magnetospheric material with the gases from these moons produces a range of phenomena from strong electrical currents to radio emissions to bright auroras. Magnetospheres can be studied in several ways: We apply the physics of plasmas to model magnetospheric processes and compare model calculations with measurements made by particle detectors flying through a magnetosphere, and with different forms of emissions detected by telescopes and spectrographs based at Earth or on spacecraft.